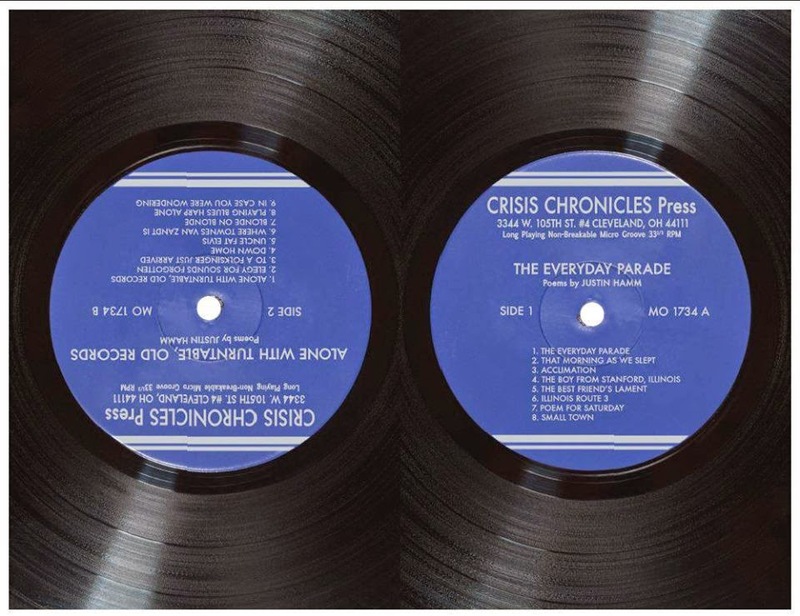 Crisis Chronicles Press is thrilled to announce the release of The Everyday Parade / Alone With Turntable, Old Records, a dual poetry chapbook by Justin Hamm, on 22 August 2013. According to the author, "the back cover is printed upside down...to approximate the experience of listening to a record. The reader will read to the middle and then stop, flip the book over, and read Side Two." The Everyday Parade / Alone With Turntable, Old Records was chosen as one of The Best Chapbooks of 2013 by The Scrapper Poet and as one of The Best Chapbook Collections of 2013 by Karen J. Weyant. "With a wisdom beyond his years, Justin Hamm presents tributes, laments, and elegies for the everyday and the working class, influenced by the best tradition of American folk and country music. The ghosts of Elvis, Hank, Townes, and Dylan ride shotgun — 'the mangiest and most / loyal-looking mutts ever' — as Hamm exposes the 'underbellies of the last minstrels' and shines a perfectly wrecked light on 'the one period / in all of this long lie called history / without room for heroism or holiness.' And yet, that is exactly what these poems sing of, the heroic and the holy, and the choruses echoes on long after the last poem-track gives way to silence." "Put this poetry album on your turntable and listen as Justin Hamm spins you back into the origins of American song and the center of communal life. Share the voices he recovers and praise him for having the wisdom to savor 'the loveliness / of [his] wife’s hair tucked behind her ears / and the almost imperceptible music of [his] little daughter’s sneakers / swishing through the…backyard grass.' He knows what to sing!" The Everyday Parade / Alone With Turntable, Old Records by Justin Hamm is approximately 40 pages, saddle staple bound and hand assembled, 5.33 x 7.9 ", laser printed on white cover stock, deep purple endpapers and white pages. 100 copies in print, with only 2 still available (as of June 2014) for $7 from Crisis Chronicles Press, 3431 George Avenue, Parma, Ohio 44134 USA. An electronic edition will be available via Amazon Kindle in the summer of 2017. Click here to read Kathleen Kirk's review of the chapbook in Prick of the Spindle. Click here to read Michael Meyerhofer's review at Trouble with Hammers. Click here to view ratings of this chapbook at Goodreads. Click here to read "The Everyday Parade" in Atticus Review. Click here to read "Uncle Fat Elvis" in the Crisis Chronicles cyber litmag. Click here to read "To a Folksinger Just Arrived" in the Crisis Chronicles cyber litmag. Click here to read a 2013 interview with Justin Hamm in Speaking of Marvels. Click here to read a 2013 interview with Justin Hamm in Sakura Review. Click here to read a 2012 interview with Justin Hamm in Midwestern Gothic. Originally from the flatlands of central Illinois, Justin Hamm now lives near Twain territory in Missouri. He is the the founding editor of the museum of americana and the author of the chapbook Illinois, My Apologies (RockSaw Press, 2011). 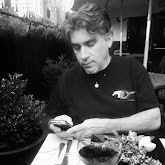 His work has appeared, or will soon appear, in Nimrod, The New York Quarterly, Cream City Review, Spoon River Poetry Review, Sugar House Review, and a host of other publications. Recent work has also won The Stanley Hanks Memorial Poetry Award from the St. Louis Poetry Center, been featured on the Indiefeed: Performance Poetry channel, and been nominated for the Best of the Net Anthology and the Pushcart Prize. Justin earned his MFA from Southern Illinois University Carbondale in 2005. Update: Justin Hamm's first full-length collection of poems, Lessons in Ruin, will be published by Aldrich Press in 2014 and is now available for pre-order from justinhamm.net.